At 16:08 hours on the afternoon of September 3rd, the Oceanside Fire Department was alerted to a reported propane tank fire at 460 Brown Court [Cousins Metal off of Hampton Road]. 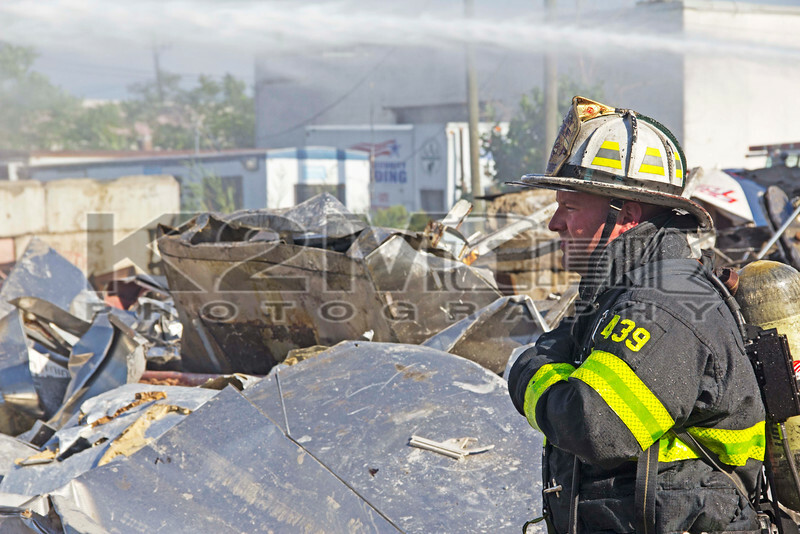 Prior to arrival responding units were met with heavy smoke in the area of the scrap yard. Upon arrival units found fire throughout a large pile of scrap metal to the rear of the location. Chief Klein immediately requested a FAST to the scene along with an extra ladder. Island Park Ladder 223 was designated the FAST for the operation and Long Beach Ladder 2372 was the extra tower ladder on scene. Oceanside Engine 246 was the first engine company on scene and put their deck gun to use along with a two and a half inch hand line. Oceanside Ladder 244 hit the fire from above with a master stream. The Long Beach ladder set up alongside the fire but was not utilized. Also notified to respond to the scene was Nassau County HazMat due to the various contents that were exposed to fire. Despite the heavy smoke and fire firefighters made a quick knockdown of the main body of fire. Heavy duty equipment belonging to the yard was utilized to help overhaul the fire. Workers stated they were cutting the scrap pile when they struck something igniting the fire. The cause of the fire remained under investigation. Rockville Centre sent one engine, one ladder, and one ambulance to stand by for Oceanside during the operation. Baldwin also sent one stand by ambulance. All fire department units were under the command of Oceanside Chief of Department Kevin Klein .